JPMorgan Chase reported its quarterly earnings today. The headline was $2.1 billion in net income, beating analysts’ estimates. Behind the headlines, it was similar to the story that Goldman told earlier this week: a huge jump in fixed-income trading, status quo everywhere else, and continuing writedowns. For example, if you look at the breakdown of revenue by type of activity (not line of business) on page 4 of the supplement, you’ll see that revenue was flat or down in every category except one: principal transactions, where it jumped from a loss of $7.9 billion to a gain of $2.0 billion. That $9.9 billion improvement more than explains the entire increase in pretax profit from negative $1.3 billion to positive $3.1 billion. As with Goldman, it was clearly a good quarter for JPMorgan; making money beats losing money any day. But the question to ask is whether it is sustainable, either for JPMorgan or for the banking industry as a whole. To answer that question, here are some pictures. So for JPMorgan to reproduce these results quarter after quarter, it would have to have unprecedented, exceptional, super-duper fixed income trading revenues quarter after quarter. Now, JPMorgan’s prospects may be better than they were before the bust, since two major investment banks are gone, one of them absorbed into JPMorgan itself, meaning less competition and higher fees all around. But we also know that last quarter was a bit unusual because of the massive unwind at AIG, which hopefully will not be repeated. 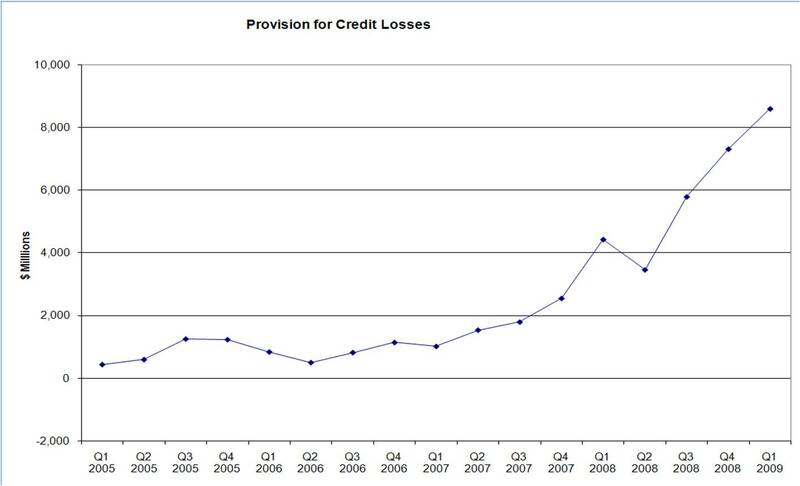 And here’s the dark side of the story: quarterly provisions for credit losses. Note that these are income statement figures, so they are not cumulative: these are the provisions set aside each quarter, which should reflect the quarterly change in expectations about credit losses (defaults). The question is whether these big investment banks can make enough money from trading and fees to make up for the money they are still losing on credit exposures. Note: I got my data from the financial supplements on this page. There’s a small discrepancy in the Q1 2006 numbers, depending on whether you look at the Q1 2006 release or the Q1 2007 release. But it’s only about $100 million, so I didn’t bother looking into it. This entry was posted in Commentary and tagged banks, JPMorgan. Bookmark the permalink. Did JPMorgan also have an orphaned December available to play around with? I think you’re missing James main point that the earnings from this quarter show now sign of being sustainable. It looks like classic pumpanddump trajectories and PONZI schemes. Targeted and well timed rumors or strategic statements, combined with extraordinary largess from the government and the usual handsoff seenoevil, hearnoevil, smellnoevil approach from regulators, not to mention trillons of taxpayer dollars redistributed into a single sector – and select speculators drive up stock prices in accelerated velocities, proclaiming the end of the bottom or a return of the bulls. Yet all the fundamentals remain unchanged. The finance sector voodoo that erased mark to market accounting unnaturally improves the balance, toxic assets growing evermore toxic are dumped on the government at the taxpayers expense, and this unholy fairy tale will continue until the next calamity, wherein insiders and predator class operators will quietly in the cloak of night cashout their illgotten 30% fabricated gains, and the next collapse is heaped onto the American public. The swindlers and thieves on Wall Street funnel billions of dollars into their personal offshore accounts, the underlying structural problems and intrinsic flaws remain unchanged, and because these predator oligarchs are something called toobigtofail, – the government robs and pillages even more taxpayer dollars to bailout the banks from the blackhole they conjured, are refuse to recognize as endless pit insolvency. Way to Geithner. The stock market is up. I hope you sleep well at night knowing that the American middleclass taxpayer is facing a dire and brutal future with less jobs, lower paying jobs, no job security, no bargaining power, significantly lower home values, lost pensions, no hope for healthcare support, little hope for sending their daughters and sons to college, – but the bank oligarchs, and the predator class swindlers and thieves Giethner and apparently Obama are bent of shielding all costs are fine and dandy with billions of tax payer dollars stuffed into their off shore accounts. It’s enough to shatter faith and hope in the very idea of America. We are a nation of the predator class, by the predator class and for the predator class. Well, JPMorgan also absorbed Bear Stearns (thank you, Maiden Lane). 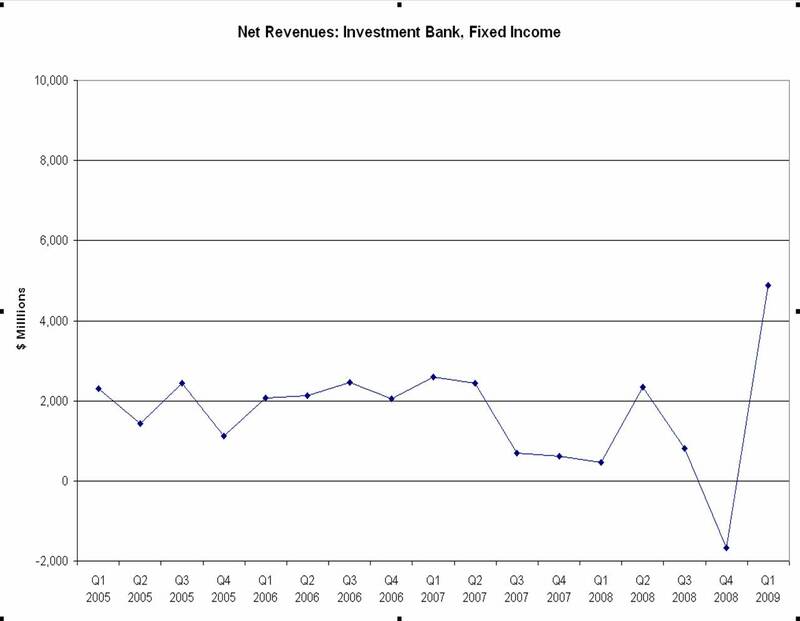 So historical investment banking numbers, especially for fixed income, might not make for meaningful comparisons. I wonder what kind of “fixed securities” they are trading to give them these kind of dramatic changes of profits? I came to US to seek the freedom and democracy. I thought my native country was dark enough for me to leave. Now I realize US even more dark and corrupted. It is a shame! Maybe this is the human nature. No way out. Have you seen the claims made in the Zero Hedge post directly substantiated elsewhere? Every bank seems to be reporting large PnL from the fixed income division. (i) The implicit argument seems that this is a result of large bid/offer spread charged to clients (large bid offer resulting from higher vol in market which always gives the desk a free option, and fewer banks to compete with anyway). If anyone has any guessestimates of this sort of thing, could be useful. (ii) But I have a suspicion that the really chunk numbers come from marking up some parts of the book (such as convertible bonds). AFAIK, most desks had marked the books down aggressively in dec 2008 (not getting a bonus anyway), and marked them up again in Q1 2009. Mid office is supposed to prevent this, but they dont usually have a clue. Did JPMorgan participate in any PPIP transactions? Could they have put assets they’d previously written off in the PPIP auction to make a 100% profit off their sale? A $7B improvement quarter-over-quarter seems unattainable in the current market at large. I certainly look forward to seeing how the illusion works. I know I am the minority here, but I actually have a good feeling about all the banks making good money this quarter. That occurred to me, and I probably should have dug deeper. I figured the basic point was still valid because the Q1 results (in fixed income and investment banking generally) were SO much better than in previous quarters, including post-merger quarter(s). I guess your point is that if you compare Q1 now to the height of the boom, maybe Bear + JPMorgan during the boom was comparable to JPMorgan now, so Q1 could be sustainable. I guess that is plausible. PPIP has not yet started afaik. But your point is near the mark: The mere presence of the PPIP has caused prices to rise, since there is now a stupid buyer in the market (govt). No, I have not. Which raises the question of whether I should be linking to them the way I am. (Potential journalistic ethics quicksand approaching.) I guess (a) I count on readers to use their own judgment when looking at link targets, which includes applying different levels of skepticism to different sources – maybe that’s a mistake; and (b) in this case, a lot of what Zero Hedge says does conform closely to things we have strong reason to believe to be true. That doesn’t mean it’s all true, but I think it’s more than just plausible. I agree Anon, the nattering nabobs just don’t want to accept these banks turned the corner. Now, I hope Treasury does allow TARP to be repaid. It demonstrates why Goldman is top dog, using TARP as a line of credit provided by taxpayers. I just hope they keep their bank holding company status and FDIC insured TLGP debt, because expecting them to remove all public funds would be over the top, especially when there are no pesky strings attached to that public money. It would be groovy if Treasury set up an actual line of credit for Goldman, to be drawn down at will (Goldman’s will, that is). Even more convenient would be if the US governemtnt just guaranteed all of Goldman’s activity forever and ever. I thought this was about “What happened to the global economy and what we can do about it”. Has the blog now changed focus and turned into a financial analysis blog for investors? Anyone, what is the purpose of this post? Thanks. I was just curious. I have not followed that blog in the past, so I haven’t formulated an opinion as to the author’s credibility. But I was very skeptical the first time I saw it, for various reasons. One has to take into account that we are in an environment where interest rates are being manipulated. There is such a difference between the banks’ cost of capital now and the spread opportunities present in FI products that making profits in fixed income (with or without AIG winding down its holdings) should be like shooting fish in a barrel. I think this is one of those “the banks are going to try to tell us to forget that time it seemed like they were insolvent, but don’t believe them” posts. The biggest threat to the global economy is that society starts to believe again that the road to continued “growth” and wealth passes through letting the banking system maintain its size relative to the rest of the economy (see Krugman’s latest post about how we don’t really understand what FS growth means for the larger economy… and the fact that they can’t grow faster than the larger economy makes perfect sense if we think of them as middle-men just helping direct capital to the people that actually make stuff). 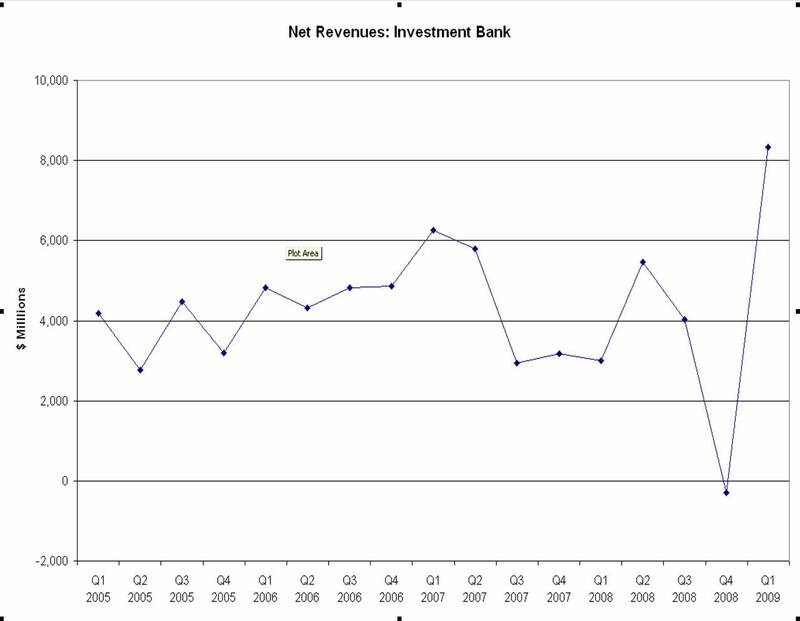 Every one of these bank-success reports leads us further down the road of reestablishing the status-quo and so I think debunking them is a perfect example of the “what to do about it” role of this blog. The people who are participating in the preparation and dissemination of these earnings reports are setting themselves up for criminal indictment down the road unless the institutions in whose service they are taking these actions survive for the applicable statute of limitations period. How the issue is framed ex poste is going to come as a nasty to surprise to more than one corner cutting careerist trying to exceed the expectations of his superiors, and to those superiors who believe that the end justifies the means, when the survival of their organization under its current management is at stake. If we’re looking at a derivative, isn’t it odd that the number never goes negative? Even in 2005, it looks like it had a cumulative increase of more than $1 Billion. This seems like it should have been worrying on its face. What I like is that those are Numbers graphs. Down with Excel! does this mean that now that the banks are profitable they will not need more fed/taxpayer money…that the 1=2 trillion talked about won’t be needed? or that now that they new fancy accounting makes the legacy assets good and they are now all holding them to maturity (as they are accounting they will/are) that we won’t need any PPIP with taxpayer backstopping? I just want to say thank you. This is the kind of evidence based analysis I am looking for. A key part of Obama’s plan is to improve bank health by improving their profitability. This way, the banks can earn their way out of their mess. If indeed, the banks can’t sustain their profitability than I will readily admit that you and Simon are right and that we should have nationalize problem banks from the start. Anyway, things are still a bit too early to tell. We’ll see. This is the most relevant argument. There are two primary drivers to fixed income businesses – 1) market making in OTC markets (credit, rates, CDS, derivs, etc.) and 2) securitization. 1) In a simple market, sell side firms earn the bid-offer spread, as the buy side firms (hedge funds, PIMCO, etc. ), take directional views. In the fixed income market, the bid offer spread has widened considerably, and the number of market makers out there has decreased drastically. So you have a wider profit being split among a smaller number of market makers. Because the FI market is primarily OTC, the barriers to entry are huge, and until the CDS market moves through a clearinghouse and ultimately to an exchange, you will see the remaining players (GS, JP, etc.) benefitting tremendously from the disappearance of Leh, Bear, and ML. 2) While the mortgage pipeline may have stopped, the majority of assets on balance sheet from Fall 07 are probably still there (aside from a few noteworthy transactions such as Thain’s famous 22cents on the dollar trade in July 08, nothing has really changed hands). Now compare a MBS CDO to a traditional loan portfolio of a commercial bank. The credit exposure might be similar (gross approximation), but the first is marked to market and the second is kept at par minus loan loss reserves. Lets look at the marking for each. As an outsider, the only liquidity I see in the first is Merrill’s 0.22 trade…so regardless of senior management optimism, the mark can’t be much higher than that. On the other hand, credit loss provisions at BoA were something like 3% of the overall portfolio. Unless I’m mistaken, this translates to a mark of 97? The point is, the loan book is marked entirely in-house and is up to management’s discretion. The securitized assets that sit within fixed income have a traded market (albeit very thinly) around which companies can mark things. Now compare Q4 08 to Q1 09 across both profit centers. In Q4 08 there was no trading in the markets (no market making profit), and we thought the world was going to collapse, (so securitized valuations presumably fell through the floor). In Q1 09, not only did trading resume, but with credit markets operating a bit more normally (TED spread back under 100bps, rather than at 460 or so), its not hard to see a huge spike in revenues from fixed income. So we give cash to the banks at 0.5% and they lend it back to us at whatever they can get away with and we insure those loans. And somehow the inevitable profit is due to talent that needs mega buck bonuses and demonstrates the inherent strength of the financial industry. lol. Take a look at the CDS spreads on the US banks. Then GS does it’s ‘we’re fine but everyone else is a basket case’. Does anyone else suspect GS has now unloaded it’s US Bank CDS positions before Geithner threatens to pull GS’s guarentee. Does this “income” include any gains from the drop in the price of their own debt? That is one threat all right. But there are many other big threats lurking. Like for instance the belief that all we have to do is to make sure the credit rating agencies do their job better… so that we can trust them even more next time… or that all our regulators have to do is to start measuring systemic risk ignoring that our regulators are themselves the greatest source of systemic risk. “Let the banks earn their way out” is the most insidiously disingenuous proposal in this entire sad story. 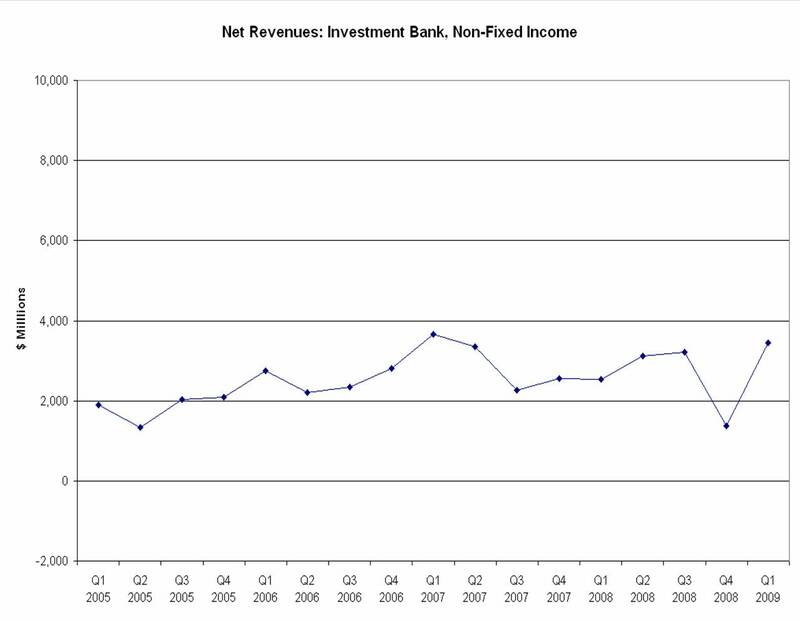 It seems as if every “profitable” bank is only questionably profitable. Smoke and mirrors tricks only work for so long and only breed more suspicion which will not help confidence levels. This potentially sets us up for another major panic sometime in the not too distant future. One can only hope that we still have the resources and political capital to handle it when it happens – and I’m doubting more and more that we can and will. I for one welcome our new overlords at 85 Broad! Whats good for GS is good for everyone! Wow Nemo, sounds like a infinite money making machine you got there! With your scheme, all the banks can get healthy tomorrow if they just borrow a gazillion dollars from the Fed today! What is holding those dastardly bankers back? If only they listen to brilliant Nemo, we’ll have a V shape recovery for sure! Peter Fisher at Blackrock seems to think there is some truth to it. So I wouldn’t worry too much about linking it. And David Viniar wouldn’t deny it outright, which is a pretty good clue there is at least some truth to it. That “I don’t even know” part is hilarious, sure the CFO of Goldman doesn’t know weather or not they made any money from a huge counterparty like AIG or not. Yeah right. Incredibly superficial analysis. JP Morgan is actually over reserving and creating a cookie jar that they can dip into in the future. My take on JP morgan’s earnings is that they don’t want to show too large a profit until the political scrutiny has died down. With the gift of WM and Bear Stearns this company is going to be an earnings powerhouse in a year or two. If these banks are all booking such massive gains in fixed income, who is booking the losses? As far as I remember, trading is a zero sum game. Shouldn’t we be seeing big losses somewhere? Interesting analysis. My response is does GAAP allow a public company to treat reserves as profits? I may have missed it but so far I see no mention that these firms do not need to mark assets to market. Just in time for the reporting season the Financial Accounting Standards Board (FASB) gave firms more leeway in valuing assets. This allows them to pretend assets are worth more then they really are and defer losses for some time in the future. Also no one mentions off book details (Citi has nearly $1 trillion off book), or level 3 details, or credit exposure with derivatives (JP Morgan’s credit exposure is some 400% to capital, while Citi is nearly 260%) If all were “accounted” for how would their bottom lines really look? Anyone care to offer a true anaylsis? That’s the best question. This deserves a really really close look. “The taxpayer” is a too convenient answer and actually hides the details of the criminal work. As long as no one is interested in the details and the public isn’t aware and doesn’t understand what a scam this really is, there is no political way to change this. Really sad. wow, you didn’t get nemo’s comment at all, huh. Hmmmmmm….if govt. influenced rates in FI mkts allow banks to pay 0.5% for capital, then loan it out at much higher rates, that is a money making proposition. and it seems the interest spread (NIM) is much wider than normal times (anyone know if that is correct?) If the banks can make enuf profit over the next 2, 4, 8, quarters (i don’t know if they can) they they might be able to fill the smoldering crater (formerly known as tier 1 capital) on their balance sheet. and they may become solvent. but they can only make such profit with FI mkts heavily influenced by the Fed Govt….and the Fed Govt is using (burning) taxpayer money to do that. So it’s a slow transfer over time from US Taxpayers to bank debt and equity holders. Remind me again why the govt doesn’t just let the losses fall on the bank bondholders? Yes, if the expected losses don’t materialize in the future the money they reserved today (took as an expense) can come back in the future as profits. Yes, I believe that was Nemo’s point, too. No one seems to want to face the simple fact that you are bankrupt, as a nation. The promises you have made, and the mounting debt you are taking on, far exceeds your ability to pay your long term obligations. That’s the “bottom line”. All of the rest of these discussions are irrelevant, until you resolve that “baseline” issue. You have promised to pay, more than you have the ability to pay. Great post! I borrowed a chart, added my own commentary and threw you a link. This is mostly wishfull thinking on your behalf Adios. The numbers are only absolutley large, and are infact relatively mediocre. U.S. national debt as a percentage of GDP is middle of the pack for a developed nation, and well behind Japan, Italy and many European ones, let alone developing coun tires. But, even more importantly. The term bankrutpcy is not easily applied to a whole nation, as opposed to indiviuals. The capital stock, intellectual property, future earning potential based upon historical norms, technoligical innovation, productivity, and many more factors too numerous to list here, makes the U.S. the most dynamic economy in the world. Thus the U.S. is the most creditworthy borrower on the planet, and thus NOT bankrupt, which by defintion requires an in-ability to borrow.